I’m a software engineer at the Edge Cloud provider Fastly. We specialise in real-time content delivery for some the worlds largest brands. If like me, you’ve probably heard a lot of people say something along the lines of “HTTP/2 will solve this”. Myself included. However, sadly it’s not as simple as that. Resource loading in the browser is hard. When we talk about resource loading, we commonly discuss the critical path and critical requests. Combines CSSOM and DOM intro render tree Font requests are dispatched after the render tree indicates which font variants are needed to render the specified text on the page. "Provides a declarative fetch primitive that initiates an early fetch and separates fetching from resource execution." My preferred method is via the HTTP Link header. Note how low down the font requests are, even though they’re critical resources? After: By applying preload headers we’re able to prioritise and initiate the fetches early for the fonts. Note the change in order of network priority for our resources. Are indicating resource hints via the HTML response too late? This is great! However, is decorating the resources priority hints via the HTML response too late? 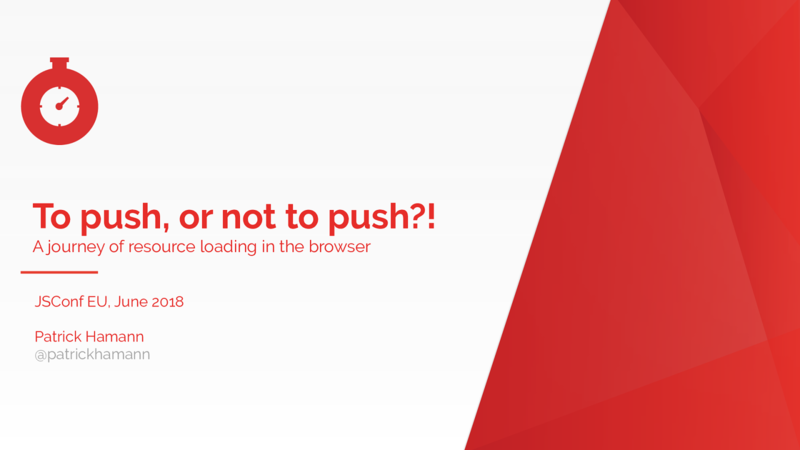 Lets look at the traditional request flow of loading a website. So the question is should we be using server push at all? The most common mechanism the industry has converged on is via the Link header and our preload friend. You must have a HTTP/2 enabled server with push support. Not that we don’t have the no push directive. Is using Link rel=preload as the push indicator in-fact too late in the connection state? This allows us to decouple the push logic from the application and initiate a push of the resource as soon as receive a request for the HTML even before we despatch the request to the application server. Achieving our holy grail of pushing during idle think time on the connection. If we have programatic access to the open network connection within our application server we can flush the CSS push before we generate the HTML. Here is an example using Node’s http/2 server to flush the push at the beginning of a request middleware. Subsequent requests come from SW so no never hit server to initialise push. The new QUIC protocol can solve this moving more work to user space instead of the kernel. The push cache is last. Items can only be claimed once I.e. if you have two tabs open to the same origin and they share a connection, only one will be able to claim a resource. Lastly the rate of adoption of push is leading to many implementers to abandon the pattern. On Fastly we observe 800 out of 1000000 responses on our network are push initiated. 6 million requests a second. We are maintaining a lot of logic and state on the server. This is where the 103 Early hints status code comes in. Proposed by my colleague Kazuho. Who here has heard of the 100 informational range of responses? Just like the age old technique of header flushing. What if we could also decorate our HTML and sub-resources to change resource priorities. You as the application author know best the priority of your resources. I’d like to leave you with some takeaways. Http2 works by sending binary data frames over the wire, rather than text, which allows interleaving of different resources in the same request. Do I have that right @patrickhamann ? ?